What is there to say about Iain Sinclair that hasn’t already been covered a million times before in a million different interviews? Well, probably not a lot actually. Lauded and derided in equal measure, as flaneur, grand inquisitor, counter-cultural historian, compulsive chronicler and a pioneer of Situationist psychogeography, Sinclair is pretty candid regarding most aspects of his long-serving career (and always has been!). With his latest new book, American Smoke, he keeps his hallmark polychromatic prose but dares to offer us something a little different this time round: a true homage to the great Beat generation. Like I mentioned before, the release of a new Sinclair book is usually a highly divisive affair: whether he’s delving into Hackney’s substrata, criticising the cities bleak artificial landscapes, comparing peasant poet John Clare to ‘the elephant man’ or offering his satirical readings of the Heathrow hinterlands, you can bet he’ll be engendering controversy. 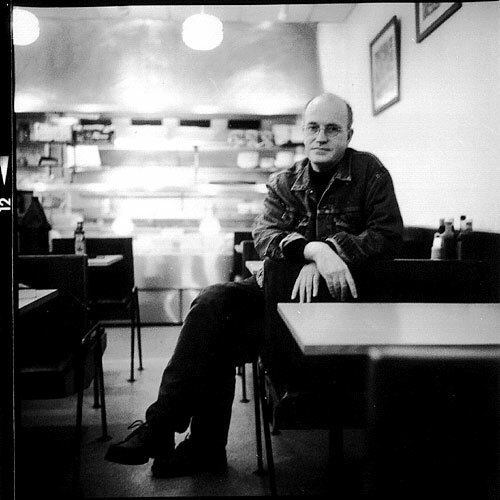 One thing is certain though, and that’s that Iain Sinclair will be remembered long after his death as the country’s ultimate post-punk diarist. NOTE: The first thing to make clear is that this is not actually a conversation: except in the way that Nabokov regarded the interview, as something to be composed at his leisure, faked ventriloquism, the author often providing both questions and answers. I prefer to talk face to face, to digress, listen, before trying to arrive at a place we haven’t visited before. So the form of the blog collision, with which I’m uneasy, is like a delayed-detonation playlet. A TV report from somewhere remote, with the interrogator waiting, painfully, for the question to register. And the interrogated standing dumb, in mid-shot, beside a road or a ruin, outside a secure building. The questions, in my case, sat on the desk for days, weeks: and then, a gap in the schedule appearing, they were dealt with at a rush, in a stuttering monologue. CK: Iain, you’ve lived in London for half a century now, what is it about the city that fascinates you so much? IS: Its unknowability. Its headbanging provocation. The way that every walk over the same ground is different. London started for me as the point of access to films I would never have tracked down on home ground. And now it’s about keeping neural pathways open. CK: Of course, you’re actually Welsh. Is national identity important to you? Has your homeland been as influential or inspiring as London when it comes to your writing? Are you ever compelled to write sprawling novels that explore human ecology and dystopian modernity in places like Cardiff or Swansea? IS: I’m suspicious of any form of nationalism. I grew up in Wales, but my father was of Scottish ancestry. He was gripped by the stories of his grandfather, a world-wanderer who wrote about his expedition to the headwaters of the Amazon in Peru. He was tasked with evaluating unknown (to London) territory on behalf of a coffee-planting company. My allegiance has always been to place, to certain long-remembered landscapes. I could never have attempted, without living there for years, a ‘sprawling’ novel about Cardiff or Swansea. But I was happy, thanks to the publishers Little Toller, to have been given the chance to return to Wales to write the monograph published as Black Apples of Gower. IS: We’re living now in what I take to be ‘the last London.’ A city so much estranged from its earlier identities (always shifting and revising) that it is unrecognizable. The process could be described as beginning with Margaret Thatcher and the manufacture of Canary Wharf and Docklands out of the isle of Dogs. The Olympic Games (and other such grand events) were seen as the perfect smokescreen for enclosures, investment silos, improving the image of destruction. But I’ve talked myself out on these topics. The trick has been to find projects that pull away from those dead zones, and the promotional language of politicians and puffers, into ritual acts of exorcism. Walks, films, books. Downriver for Thatcher. London Orbital for the Dome and other millennial follies. Ghost Milk for Westfield and the Olympic piracy. London Overground for the doughnut of speculative railway suburbs, new-build blocks with artisan coffee and balconies for bikes. CK: In American Smoke you actually leave London and relocate to the USA. Were American writers a big influence on you, the Beats especially? IS: My romantic side was drawn to the energies of Beat writing from way back. I was reading the Kerouac books as they appeared. And I was lucky enough, in my early twenties, to spend time filming with Allen Ginsberg at the time of the Dialectics of Liberation conference in 1967. It seemed to make sense, as a way of shaking free of the black-hole gravity of post-Olympic London, the corporate state, to reconnect with the myths of the Beat writers, as well as with pre-Beat outsider figures like Malcolm Lowry, and the post-Beat Chilean novelist and poet Roberto Bolaño. American Smoke, which I enjoyed writing very much, is about bad journeys, terminal quests, not getting to Mexico. CK: I read the book on the movie Crash you did for the BFI, I think it’s safe to say that Ballard has been a significant influence on your work. Aside from appearing beside him briefly in the Mary Harron documentary and his contribution to “London: City of Disappearances,” did you know Ballard well? IS: I got to know Ballard late on, around 1999, after hearing much about the seminal years of New Worlds and the fragmentary assembly of The Atrocity Exhibition from Michael Moorcock, a good friend. We used to have meals, around Shepherds Bush, every few months, with Ballard and his ‘girlfriend,’ Claire Walsh. So I became familiar with social aspects of the man, but I wouldn’t say that I got to know him any better as time went on. He was always engaging. He never talked about his work or the books he was involved with. He might call for a special bottle to celebrate the end of some project and the start of the next one. Beyond anything else, he remained the professional writer. He wasn’t as alien and forbidding a presence as William Burroughs, but the central mystery was always a mystery. CK: I heard you have a few Burroughs first editions in your book shelf too. You corresponded briefly with Burroughs via airmail. Can you tell us about what kind of relationship you both had? IS: I didn’t know Burroughs at all. Even though I met him a couple of times and spent one long afternoon with him in Lawrence, Kansas. He was an earlier and more viral influence than Ballard. As I got to know Jim, I appreciated what he was doing more and more. The coolness, the clarity. The heroic and undeceived perversity. Burroughs wasn’t perverse, strangely enough. He was a prose-poet with a formidable sense of otherness. You had to know him much better than I did to excavate the humanity and the bite of the humour. I corresponded with him as a student and published one of his pieces in Dublin. Then we tried to set up a film for West German television, but he decided, at that moment, to get immersed in Scientology. CK: Can you tell us a little about Psychogeography? IS: I don’t think there is any more than can be said. The topic has outlived its usefulness and become a brand. CK: Do you see similar parallels between you and Kerouac? Do you think On the Road could be considered one of the original staples in the field of psychogeography? IS: On the Road, even after the editors ‘normalised’ certain aspects of how the work is presented, is about raw excitement, long-breath, open-field composition; neurotic rhythms, risk, astonishing sensory memory and fluid juxtaposition of detail. It’s not a Situationist work or a strategic, confrontational piece. It’s ripe with premature nostalgia and celebration of territory, shamanic restlessness. CK: Do you think you’ll return to poetry or the graphic novel format in Slow Chocolate Autopsy? IS: I never left poetry, as such. It’s just that the way I published became more and more covert. I preferred to operate on my own terms, through micro-presses (including my own). I have a new gathering called Seeschlange coming along from Rod Mengham’s Equipage. Etruscan Books, run by the ever-engaging Nicholas Johnson, published a substantial selection of the poetry I produced after Suicide Bridge, as The Firewall. With a generous introductory note from Michael McClure. But I’m not sure that anybody noticed. Skylight, a press based in Cheltenham, did a new edition of Lud Heat and a revised and extended edition of Suicide Bridge (the version I’m happiest with, even though they sold about six copies). I don’t see any way, at the moment, to get back to the stories and graphic strips of that collaboration with Dave McKean, Slow Chocolate Autopsy. There are new and uncollected Norton stories. And Norton has been promoted into making cameo appearances in Alan Moore’s The League of Extraordinary Gentlemen. If there was any publishing interest—unlikely—I’d be delighted to make a return to this form. CK: You have your own distribution label. Do you have any thoughts or opinions on the current state of the publishing industry in general? IS: With mainstream publishing ever more corporate and short-termist, it’s a good time for the independents. Great things are still being produced, but nobody makes any money. Which gives it all a certain survivalist edge. And relish. CK: IYR featured a comic strip by Steve Aylett that originally featured in Alan Moore’s Dodgem Logic. How did you and Alan Moore come to be associated with one another? IS: I met Alan around the time of From Hell. He was interested in, and generous about, the weirdness of Lud Heat with its arcane speculations and the conspiratorial aspects of White Chappell, Scarlet Tracings. We were involved in a number of subversive London performances. And I came to Northampton to read with Brian Catling. An evening that ended with a gunman among the graves. An episode Alan draws on in Voice of the Fire. Alan was part of the recent English Journey tour. And he did nice turns in the two Andrew Kötting films, Swandown and By Our Selves. I’ve just finished reading Alan’s remarkable local epic, Jerusalem. It will take five years to absorb it fully. CK: What’s the worst job you’ve ever had? IS: I’ve never had a real job: parks gardener, white-lines-on-Hackney-Marshes, ullage cellar in a brewery, loading and unloading containers in old Stratford—that wasn’t frustrating or infuriating at certain times. But,in essence, I enjoyed them all. For themselves. For what they told me about London. And my fellow workers. And as future material for written and unwritten books. The worst days were probably handling toxic materials or dripping sheep casings in Chobham Farm in the bitterest deeps of winter. But, as ever, the worse it got, the better the potential routines. All life is a paragraph waiting to be shaped and exploited. Originally published on Chris Kelso’s website. Great piece…glad I stumbled across it!